"OK, I know that if you cut mushrooms into equal pieces they will cook evenly and if the quiche fillings are neatly arranged in the pastry case everyone will get a fair slice. But all this symmetry is boring!!! Tearing up mushrooms with your fingers creates different textures and tastes. 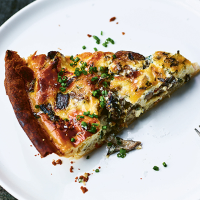 In the same way, putting the filling ingredients randomly in the pastry case challenges you at the table as you have to decide which slice of quiche you want: would you rather have more melting cheese or more woody mushrooms? Regularity might be satisfying but irregularity stirs up emotions." 1. Heat a little oil in a frying pan [skillet] or – better still – a grill pan, over a medium-high heat and fry the mushrooms, having first taken care to either spread them flat or carefully tear them into large (about 2.5cm [1in]) pieces. Turn them over from time to time until they are nicely charred and then remove from the heat and set to one side. 2. While the mushrooms are still hot, add the butter, garlic and chopped herbs and season with salt and pepper. Stir gently and resist the urge to eat them as you’ll need them later! 3. Preheat the oven to 200ºC/180ºC fan/400ºF/Gas 6. Roll out the pastry on a lightly floured board until 5mm [¼in] thick and lift into a 25cm [10in] loose-bottomed tart tin [tart pan] that you’ve greased with butter and lightly floured. Bake blind for 15 minutes. When the blind baking is done, remove from the oven but leave the oven on. 4. For the ‘custard’ filling, whisk the milk, cream and eggs together in a bowl and season with salt and pepper. 5. When the pastry case comes out of the oven, remove the beans and parchment and scatter the mushrooms, blue cheese and chestnuts in the case. Carefully pour in the ‘custard’ and bake for about 45 minutes or until the filling is golden but still slightly wobbly in the centre. This recipe was first published in Wed Oct 10 12:32:51 BST 2018.